Finland is an evocative land. The very mention of it conjures visions of endless darkness, long, cold wintry nights and an almost oppressive bleakness. It is within this icy cauldron that the soul of Insomnium was born. Their music is as epic as it is melodic, as melancholic as it is majestic and as brutal as it is beautiful. To call Insomnium a Death Metal band is to do them a grave disservice. Their last release, "One for Sorrow", was such an amalgamation of styles that pigeonholing them into a single category would be to rob the band of its true complexity and ignore the very essence of its sound. 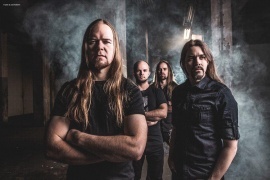 Formed in 1997 in the town of Joensuu, in Eastern Finland, Insomnium released two demos that led to a deal with UK label Candlelight Records. Founding members Markus Hirvonen (drums), Ville Friman (guitars) and Niilo Sevänen (vocals and bass) added guitarist Ville Vänni to the band for the release of their Candlelight debut in 2001 Throughout the following decade, the band went on to release four more highly acclaimed albums, the most recent of which, 2009’s "Across the Dark", entered the Finnish album charts at #5. Along the way, they picked up a couple of awards in their homeland for Best Band and Best Album. The band supported "Above The Weeping World" and "Across The Dark" with a furious touring schedule, traversing both the States and Europe with the likes of Amorphis, Katatonia, Enslaved and Satyricon. They capped off the album cycle with a co-headlining tour with their friends Ghost Brigade and a Spring 2010 direct support slot with Dark Tranquillity. In the Spring of 2011, Insomnium entered the studio to record what would become "One for Sorrow". 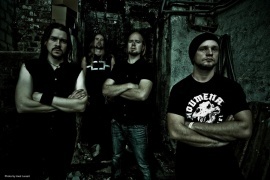 Before they embark on the supporting tour, Vänni leaves the band and is replaced by Markus Vanhala of Omnium Gatherum. This change does not at all negatively affect the work of this remarkable band. "Shadows Of The Dying Sun", which is released in early 2014, again earns praise from fans and critics alike. Register now your email address and never miss events, dates and news for INSOMNIUM.